We have just beaten Crystal Palace 4-2 in the Premier League. Some poor defending twice allowed Palace to draw level, but in the end, our attacking quality shone through. GK – Loris Karius – 7.5/10 – Couldn’t do anything about the two goals, and looked much more confident when commanding his area. LB – Alberto Moreno – 7.5/10 – A good performance on Moreno’s return to the starting eleven. Perhaps a break out of the spotlight will have worked wonders. CB – Dejan Lovren – 6/10 – Definitely at fault for their first and arguably at fault for their second. Redeemed himself somewhat with a goal. 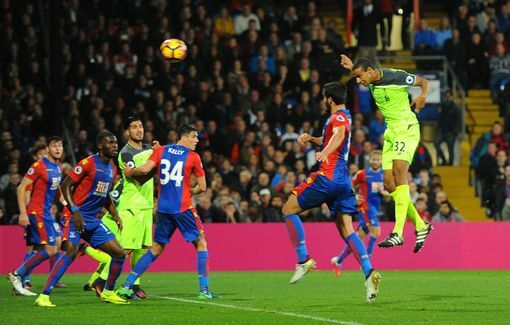 CB – Joel Matip – 8/10 – Scored a great header and look solid again at the back. Perhaps fortunate not to give away a second-half penalty. RB – Nathaniel Clyne – 7.5 – Another good all-round performance from the consistent England man. CM – Jordan Henderson – 8.5/10 – Quietly but brilliantly went about his business. Made more passes and more tackles than anyone else on the pitch. CM – Emre Can – 8/10 – Getting better and better with every game. Scored the first goal. CM – Adam Lallana – 7/10 – Not quite as impressive as in recent games, but still worked hard. AML – Phil Coutinho – 9/10 – Magical. Simply magical. AMR – Sadio Mane – 7/10 – Looked a touch off the pace and missed a sitter in both halves. ST – Roberto Firmino – 8.75/10 – Maybe not quite as good as Phil, but another wondrous performance in the false nine role. Gini Wijnaldum – 7.5/10 – Added some composure to the midfield in the final 15 minutes. Divock Origi – N/A – Played last two minutes. Ragnar Klavan – N/A – Played the final minute.